T.O.p Dogs – Baby It’s Cold Outside! Welcome to another instalment of T.O.p Dogs. Photographing Loveable Four-Leggers in and around Toronto. This handsome guy was waiting outside while his human was picking up a Starbucks. He looked very spiffy in his winter coat. He sure does look spiffy, Edith. I am so loving that fur-trimmed hood. This is a wonderful portrait. 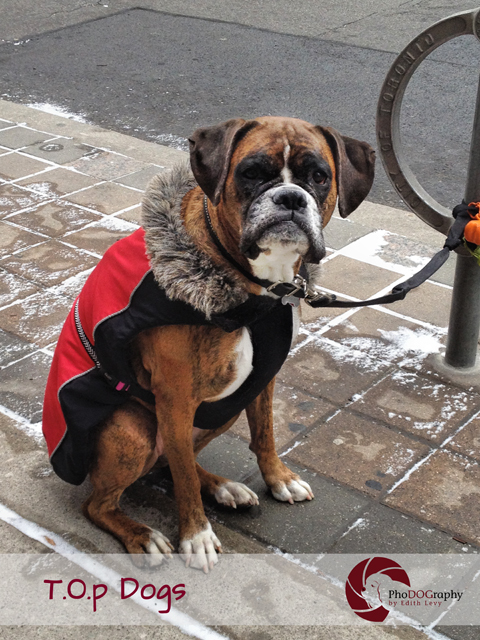 I am amazed by a boxer that can wear a coat. Mine will not wear anything extra. Thanks Sonya. He looked really cozy.